Let’s begin this review with a wee bit of unadulterated honesty, shall we? (Note: This is not to imply that I regularly start most posts with dishonesty…just sometimes) Let’s just air the proverbial “dirty laundry” and say what everyone’s thinking. Treyarch is the “B-team” of Activision’s “ever-rising money pit” known as the Call of Duty franchise. To be frank though, I think the real injustice is not that Activision (no matter what their inept PR campaigning will say) refuses to admit this blatant hierarchy of excellence exists, but rather that they’re so driven to have a CoD game arrive annually, that one developer is not able to have sole ownership over the content created. Seriously, I want you to look at the quality of Call of Duty 4: Modern Warfare and Call of Duty: Modern Warfare 2 and not tell me that the fact that it only took Infinity Ward four years combined to develop them is anything short of amazing. In addition, I’d like to know how many serious Modern Warfare 2 players would have put up with that excellent online multiplayer for two years, instead of needing another “fix” annually. You’d think with all the “fine tuning” of servers, the bugs and consequent patches, not to mention the battling of hackers and glitchers and adapting to new weapons and play styles that few would want to “jump ship” on the well-oiled machine that was (and still is) MW2. At least, that’s what one might think. Yet Activision has proven with Call of Duty 3, (2006) Call of Duty: World at War, (2008) and Call of Duty: Black Ops (2010) the ability of a franchise name to mitigate the sales of a possibly inferior product. Every year, around November, one buys a Call of Duty game, just as certain as the Sun rises in the morning and seasons change (though, from what I’ve heard, global warming may soon…”complicate” that). The real “loser” of this arrangement in my opinion, however, is Treyarch. Sure, they probably haven’t sent everyone to therapy, or bought everyone “You’re Special” Hallmark cards that blast “Walkin’ on Sunshine” when you open them, but it has to hurt knowing that you’re known for tiding people over, rather than inciting genuine anticipation. This all changed, however, when Infinity Ward’s two head-honchos, Jason Ward and Vince Zampella quit, and quite a few of their fellow staffers followed. With the fate of Modern Warfare 3 in question, Black Ops was suddenly elevated from a Call of Duty title to the Call of Duty title and the developer who’d been previously best known for Spider Man 2 had Activision’s franchise resting on its anthropomorphic shoulders. Is that enough “scene-setting” for all of you? I know it’s longer than the trailing yellow text at the beginning of every Star Wars film, but I figured some background wouldn’t hurt. Meet Frank Woods. He's got more tats than most NBA players, but probably not as many guns as Gilbert Arenas. If I had to describe Call of Duty: Black Ops in two words…I’d probably rewrite the sentence so I didn’t have to. I kid. Honestly though, I’d go with “inexplicably undefinable.” By that, I mean that Black Ops refuses to answer the simple questions that provided the foundation of previous games in the series: What fight (World War II: European Theater, Pacific Theater, or both, the future “War on Terror”) Where (Germany, France, Japan, Iraq) and Against Whom (Nazis, terrorists, Japanese, nationalist Russians) and provided an elusive title that fails to provide easy answers to these inquiries. This can likely be attributed to the “need to know” narrative, which as the game’s title clearly implies, powers the title (making it, in my opinion, a strong contender for the best CoD narrative). 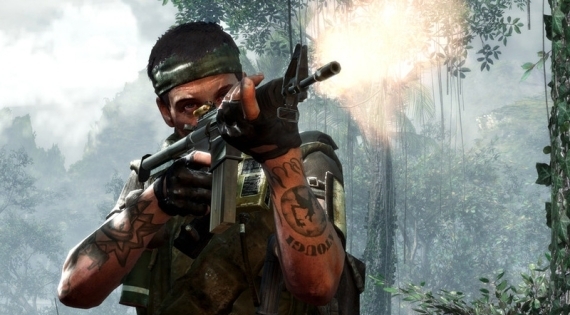 While both entries in the Modern Warfare franchise certainly understood the need to “beef up” the story elements, there has never been quite an emphasis on a singular character in those titles, as there is in Black Ops. You play as Alex Mason, a member of the CIA’s Studies and Observations Group (SOG) during Vietnam. The narrative does not begin with timed pyrotechnics and someone tossing you a firearm clearly not covered under “concealed carry” laws, however. Instead, it’s 1968, and you’re strapped into a chair enduring an interrogation at the hands of unknown figures. They insist that your actions between 1961 and 1968 have given you a unique understanding of “the Numbers,” and claim that unless you can decipher just what the transmissions of numbers mean…well…you know how these things work. Insert obligatory joke about how every CoD game needs a snow level OR a "In Soviet Russia..." joke. Your choice. With some “coaxing,” Mason is able to unearth the memories of his past missions (as well as several involving his handler Jason Hudson) after which you’ll return to the “tied down” protagonist, as he attempts to put the pieces together. In this way, Black Ops actually functions as an unconventional “mystery” of sorts, which actually had me actively guessing as to the next “twist.” Interestingly enough, there’s enough leeway room between the public understanding of historical events and the theoretically possible clandestine missions and futuristic technology that this plot mechanism is possible. Sure you’ll partake in The Bay of Pigs invasion, as well as the Vietnam War during such recognizable events as the Tet Offensive, but you’ll also find yourself in less recognizable scenarios like a Russian labor camp (see: gulag), Hong Kong, and a shipwrecked Nazi frigate in the Arctic Circle during WWII. That’s what we call variety, folks. Despite the seemingly “hodge-podge” variety of locales, the narrative flow between these is remarkably strong, and it’s almost worth playing Black Ops for the sole reason to see how these “incongruous” spots are strung together. Gameplay-wise, (for better, or worse) Black Ops doesn’t drastically overhaul the system that current-gen Call of Duty games have established. In fact, because the campaign lands somewhat between the events of historical CoD titles (see: World War II) and present ones (see: Modern Warfare) many of the weapons from previous titles have found their way into Black Ops. Otherwise, it’s the usual “run around, shoot a couple guys, hide behind cover, throw back grenade” rinse, repeat. Nothing wrong with that, no need to attempt to “fix” what very clearly is not broken. There are a few “variations on a theme” though, mind you. While past Call of Duty games mostly reserved “bullet time” sequences for breaching, Treyarch has implemented it creatively in several instances, without giving too much away (yet enough to pique your interest) let’s just say that one involves a game of “Russian Roulette” gone bad…or very, very right. They’ve also created a campaign mission that somewhat resembles the C-130 mission in Spec Ops, where you switch between giving in-air guidance from a Blackbird jet, and playing as the troops being given orders. Another has you playing through the same area from two different character’s perspectives As mentioned before, there are some nuanced differences, old mechanisms in new scenarios, but ultimately Black Ops is more about experiencing new locales and conflicts previously unseen in video games than it is about overhauling the gameplay. ...and this would be Jason Hudson. Like any other character portrayed by Ed Harris, he is not one to be f****ed with. If you don't believe me, watch Apollo 13. Or, watch one of the films where he actually kills people. I’ve heard some people argue that Black Ops visuals are clearly inferior to those of Infinity Ward’s titles. While I certainly wouldn’t juxtapose the two in such a fashion, I will say this: while Treyarch has certainly “closed the gap” that IW previously held visually, there’s still something ineffable that has me giving IW the lead, if by the thinnest of margins. Hmm…for some odd reason, I feel like Treyarch’s character models (especially the faces) seem cartoonish or like caricatures. That, or maybe they’re just more simple than IW’s. Aside from what is clearly nit-picking, Black Op’s visuals are stellar, from the explosions to the vehicle models to the characters, high class production values altogether. Character design is actually quite stellar as well: Reznov, Woods, Mason, Hudson, Weaver…all are distinctive and stand out, avoiding the “clone army” look that characterized past titles. This, in turn, is accompanied by great voice acting by Gary Oldman, Ed Harris, and Sam Worthington. Saw this on memegenerator, had to share. 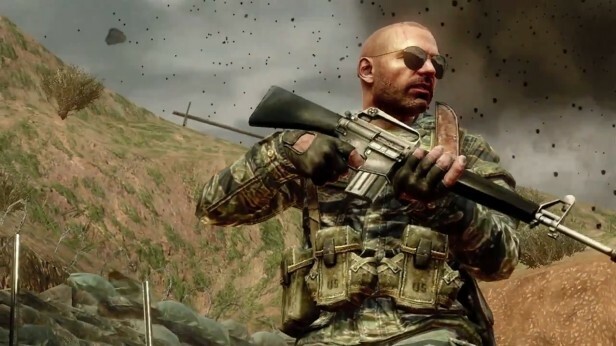 Overall, Black Ops is not the “quantum leap” that Call of Duty: Modern Warfare was for the franchise, but it doesn’t have that “mandatory sequel” flavor that Modern Warfare 2 reeks of. It isn’t controversy ridden like past entries, nor is it serious and ruminative like the original Modern Warfare. Instead, Black Ops opts (say that three times fast) to provide a personal narrative of events previously unvisited by the FPS genre. It’s no accident that you’re more vested in the exploits of Alex Mason and his handler Jason Hudson than other characters in the past, the empathy is far greater than past titles, as you worry about just what Mason has/hasn’t done. While another Modern Warfare “milk it ’till it dies” title is the next round in the chamber, the real question is where the Call of Duty franchise will go after that. 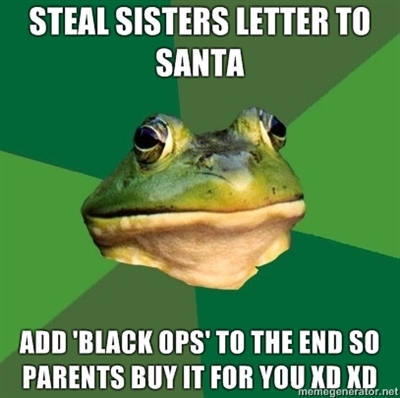 Regardless, if they concoct an engaging narrative as Black Ops did, it might just not matter. Just, for the love of all that is holy, do not end the game with the “fighter jets, aircraft carriers, big American flag, fireworks” overt patriotic cheese-fest that Black Ops went for. It was a wee bit over-the-top, to say the least.